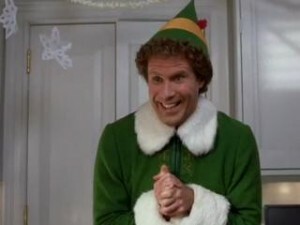 Are you among the very, very few who have not seen one of the most recent Christmas classic movies, Elf (2003)? If not, and you have been nice and not naughty this year, then you need to go ahead and treat yourself! Even if you don’t like actor/comedian Will Ferrell who plays the Elf in question, you are guaranteed to like this goodtime flick. A baby human inadvertently crawls into Santa’s sack while Santa (Ed Asner) is visiting an orphanage and winds up in the North Pole. “Buddy” (Will Ferrell) is adopted by elves (Papa Elf is none other than the wonderfully deadpan Bob Newhart) and, of course, doesn’t fit in. He’s a giant living in a Lilliputian world, and he’s lousy at making toys. Buddy reaches adulthood and Papa Elf finally tells him he’s a human. Buddy leaves the North Pole for New York in search of his human father (James Caan). Let the fun begin. Buddy — still dressed like an elf — is a babe in the woods, a true unjaded innocent wandering the streets of New York City. Everything is new to him: everyday things like crossing the street, taxi cabs, revolving doors and escalators. He brings all the wonder of a child to every encounter (including a romance with department store employee Zooey Deschanel). Buddy does find his father, but his father is less than thrilled at being found. Buddy’s dad has a family of his own and is, well, not a nice man. Buddy keeps showing up at his father’s place of work and because of his naivete, manages to wreak havoc without even trying. What makes Elf such a great film and a new Christmas classic? First of all, it references the Christmas specials we used to watch as kids, especially Rudolph. The magical world of the North Pole is juxtaposed with the grittiness of New York City, to hilarious effect. The soundtrack is utterly delightful, and each scene is funnier than the next. In fact, fans of the film have many favorite scenes. The sign of a great movie is if you can keep watching it again and again, especially because you’re waiting for all your favorite scenes which actually span the entire movie, linked together one after another. “Elf” is also imminently quotable. The three Elf Rules are: 1.) Treat every day like it’s Christmas. 2.) The best way to spread Christmas cheer is to sing loud for all to hear. 3.) There’s room for everyone on the “Nice” list. Not a bad philosophy, that.